Neil Gaiman's blend of fantasy and horror entertains adult audiences with audiobooks such as AMERICAN GODS. Terry Pratchett's fantastic and satirical Discworld series inspires devotion in his many fans. Both authors also write for younger audiences (THE GRAVEYARD BOOK, named Audiobook of the Year, and NATION, a 2009 Audies Finalist and 2009 Printz Honor book). 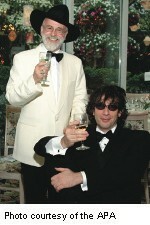 The two authors collaborated on the Armageddon farce GOOD OMENS, released on audio in the U.S. for the first time this November. AudioFile's editors spoke with the “voices” of Neil Gaiman and Terry Pratchett’s audiobooks. Nigel Planer, and George Guidall. Martin Jarvis, narrator of the recently released U.S. version of GOOD OMENS, shares his secret to creating characters through the medium of his voice—and then gives a delightful demonstration! Stephen Briggs tells AudioFile that it was Pratchett's sense of humor that initially drew him to Pratchett's work back in 1990, and he's been hooked ever since. Hear about his favorite scenes from Pratchett's latest audiobook, UNSEEN ACADEMICALS. In addition to narrating Terry Pratchett's Discworld series, Nigel Planer also plays various roles in the popular UK television adaptations of that series. He describes the challenge and adrenaline rush of creating nearly 40 characters for each Pratchett book. George Guidall is an AudioFile Golden Voice and narrator of more than 900 audiobooks. He recalls the "incredible experience" of narrating Neil Gaiman's AMERICAN GODS and then reads a selection from that title.